Rolling knee pads are designed to spare you the painful knee and back aggravation if you work on your all fours for extended periods of times (Source). Besides freeing you from knee and back soreness, these knee pads with wheels also improve your mobility and speed up job completion (Source). ​Our top pick is the Racatac roller knee pads. There are actually two versions for sale at the time of this writing (1/17), an earlier model and a newer model (the one we recommend). Let's take a look at 5 of the best-selling rolling knee dollies on the market today and see how they compare. This rolling knee tray offered by Vestil is practical, convenient and useful for people that work on their knees for long hours. Users love that the pad is easy to move, but some do note that it’s cheaply made. This knee pad with wheels measures 3-3/4 x 20-1/4 x 10 inches, and it has a molded plastic construction for durability, a built-in tool tray, foam knee pads, and a weight of 5 lbs. 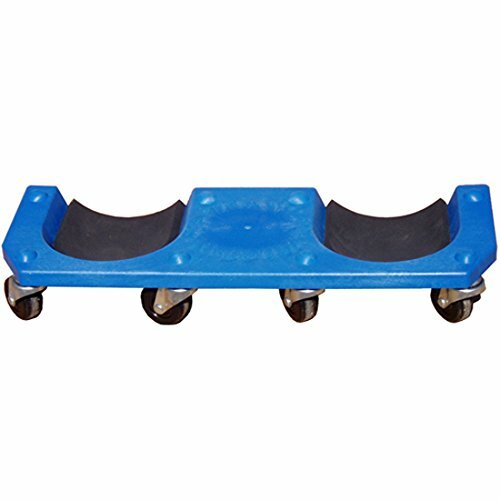 It has six 2-inch caster wheels made from an abrasion-resistant material. The recommended weight capacity is 350 lbs. In general, users have a mixed option regarding the Vestil knee dolly and most of them point out that the quality of the pad is questionable. A user comments that he weighs only 165 lbs, but the rolling knee pad broke on the first day. Another unhappy customer shares that he was careful getting on and off of the pad, but it still cracked and that he doesn’t recommend it. A purchaser states that the wheels scratched his hardwood floor and that he is very disappointed with the performance of the knee rolling dolly. On the other hand, a happy customer says that he has been using The Vestil knee pad for months and he has encountered no problems. This knee dolly with wheels offered by Bucket Dolly is well-made, sturdy and practical for carpet installation. Users love the high-quality constructions, but some do note that they had troubles using it. This rolling dolly measures 20.5” x 7.2” x 3.5”, and it has a weight of 4.9 pounds and industrial-grade knee cushions that you can replace when they wear off. It also features heavy-duty swivel casters made of rubber to avoid scratching your floor or tiles. The rolling knee pad is also easy to clean, and it’s perfect for anyone looking for a durable kneeling pad. A buyer comments that the Bucket Dolly knee pad with wheels is a necessity if you’re doing a big tile job. He says that he has done around 1200 ft of tiles and that this knee dolly has been invaluable. The purchaser highly recommends it. Another user mentions that the rolling pad is perfect for carpet tile work and that he has two of them which he uses professionally. A reviewer also adds that he weighs 200 pounds and the kneeling pad doesn’t crack. However, some customers have complained that the knee pads are too far apart and that they would be uncomfortable to use for short people. A buyer states that he found it hard to achieve balance and that he kept tripping over. If you are looking for a top-notched kneeling pad, you might take a look at this rolling knee dolly offered by Racatac. Users love the removable 7 x 15-inch tool tray, but some do note that it’s expensive. This professional kneeling tool has an outside frame dimension measuring 19.5 x 20 inches, a 1/8-inch thick frame made of industrial-grade aluminum, a web spring seat with leather covering, thick rubber foam pads, and a weight of 8 pounds. The roller knee pad also features 2-inch polyurethane caster and a one-year warranty. The recommended weight capacity is 300 lbs. In general, customers are extremely satisfied with the performance, functionality, and design of the Racatac professional knee pad with wheels. A buyer comments that this is the best rolling knee pad for tiling and that he is very impressed with its quality. The reviewer also says that he would gladly buy another one. A happy user comments that this kneeling tool takes the pressure off his knee, and he can work for hours without tiring. He also adds that he likes the ability to turn on the spot. Another satisfied customer mentions that this is a knee saver and it’s a must-have for anyone that install tiles. However, some customers have complained that the cushioning is thin and that it quickly gets flat. Some also note that the bicycle seat has limited adjustability. 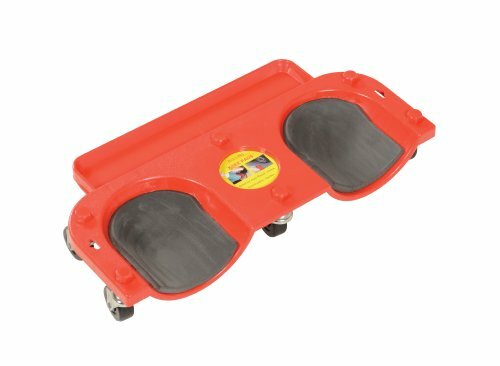 This kneeling pad with wheels offered by Racatac is well-built, durable and well-balanced. Users love the size and the design, but some do note that the knee pad is difficult to store. This kneeling sitting pad measures 20” x 19.5” x 16.5”, and it has a sturdy aluminum frame that takes the pressure off your knee, back and feet while working. 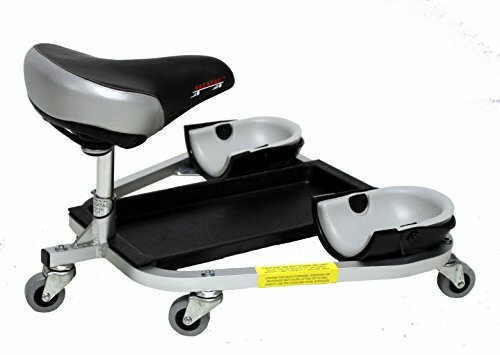 It also has an adjustable seat, 3-inch polyurethane casters, thick foam knee pads, a tool tray, and a weight of 8 ½ lbs. Overall, this is an excellent choice if you need a professional kneeling sitting creeper. In general, users have a high opinion of the Racatac kneeling sitting pad, and they agree that it’s one of the best flooring knee pads available. A buyer comments that he installed over 1000 sq feet of porcelain tiles and that this pad saved his knees, shoulders, and back. He highly recommends it to anyone looking for the best kneeling pad with wheels. A customer says that the rolling knee pad is well-constructed, rolls easily, and it provides ample spaces and support. Another purchaser states that he liked this creeper so much that he bought two and that this is the most comfortable tool for installing tiles. However, some customers have complained that the wheels can damage floors or tiles and that it has limited applications. Some also note that the padding is not thick enough. This rolling knee dolly offered by Western Safety is inexpensive, easy to maneuver and convenient. Users love the smooth moving wheels, but some do note that the knee pads are too far apart. This rolling knee pad measures 25-1/2″ x 9″ x 3-1/2″ and it’s made of durable high-impact plastic. It has cushioned knee pads, a built-in tool tray, a built-in holder, a weight of 5.1 pounds, and non-marring swivel casters. The maximum weight capacity of this knee pad with wheels is 250 lbs. As a whole, this is a perfect choice for a cheap roller knee pad. As a whole, customers have a high opinion of the Western rolling knee pad, and they praise its usefulness, practicality, and durability. A buyer comments that this rolling knee dolly works far better than he expected and that it’s handy to have it around. He highly recommends it. Another user shares that it’s a pleasure to use this roller knee pad and that it’s the perfect tool for his job. A satisfied user shares that he installs mobile electronics and that this knee creeper keeps his knees comfortable and dry. However, some customers have complained that the kneeling pad is not as durable as they expected and that the plastic broke after a couple of months. The first rolling kneepads we took a look at where the Knee-D foam cushioned rolling knee cups. The manufacturers say that these specialty knee dollies are designed to be used by service professionals, mechanics, carpenters and other repair persons that spend a great deal of time on their knees. The rolling knee dolly itself is constructed from polyethylene, which is a conscious decision to produce a rolling dolly that weighs less than cast-iron and steel and doesn't splinter like wooden knee dollies. This rolling kneepad has received mixed feedback- with many buyers saying that they purchased these knee pads with wheels in anticipation of a home repair job like floor tiling or sanding and finding that it cracked or broke down after only minimal use. Many buyers searched Lowe's and Harbor Freight before opting to purchase this particular model online- though the users we spoke to said that it was not durable, and was constructed from cheap-feeling plastic that was prone to cracking and breaking. The second option we looked at was the Bucket Dolly rolling kneepads. The manufacturer says they are designed to relieve you of the discomfort and pain associated with spending a significant amount of time on your knees installing tile, sanding floors, installing carpet etc. These industrial-quality knee cushions are outfitted with heavy-duty swiveling casters with rubber wheels designed to prevent scratching tiles. The Bucket Dolly rolling kneepads received a much more favorable response than the first option we examined- with one plus-sized buyer who weighs in at over 200 pounds and over 6 feet tall says that he has used it extensively doing flooring work and found that it was made of quality materials and functioned well for duration of the job. Another reviewer told us that he was grateful to discover these before taking on a large wood resurfacing project- his knees never became sore and he was able to scoot around the room to finish the job much more quickly than he had budgeted for. Other professional remodelers chimed in and said that this rolling kneepad was a much more preferable means of accomplishing home repair and remodeling work than trudging around on their hands and knees. The third option we examined is a little bit different looking than the others- the Racatac Kneeling Dolly has a seat in addition to the foam knee pads sitting on five caster wheels. The manufacturers say that this new style of kneeling tool is an ergonomic alternative to traditional rolling knee dollies and the even more traditional method of prone, hand and knee maneuvering. The webspring seat itself is constructed from faux leather and is soft, so you won't be sore after scooting around for several hours. One buyer we spoke with said that he was faced with an arduous tile cleaning job that normally he would undertake by kneeling on the ground and inching along the tiling over the course of six hours. Instead, he took a flyer on this advanced kneeling tool and says it quickly became indispensable- he and his family jockey for turns to use it whenever they work on home repair projects. While some buyers thought the price was a little excessive, others view it as a worthwhile investment in the health of their knees and back. Additionally, as we have seen, other knee dollies have the unfortunate habit of cracking or breaking with extended use, unlike this more durable option. The inventor of this device is actually a brickmason who wanted an easier way to lay brick floors. The resulting design was his inspiration- the kneepads are designed for added comfort and the seat has a solid grip so that when you scoot around an interior area you will not fall off. We also took a look at and earlier model of the Racatac knee dolly tool. Buyers who purchased this sitting creeper, as it's called, made use of it for home remodeling jobs, particularly with tile and floor installations to relieve painful knee and back stress. One buyer did say that the wheels do have a tendency to put indentations in softwoods and even chip tiles if you are heavier than average. Another buyer told us that for a large tiling job they decided to purchase this kneeling sitting creeper and it ended up saving them a ton of pain and agony in their shoulders, back, and knees. One reviewer did advise novice users to be careful getting onto and dismounting from the rolling knee dolly to avoid taking an accidental spill. An auto mechanic says that it is a lifesaver, effectively extending the amount of hours he can work in a day because it spares his knees and back from extreme aggravation. The last option we looked at was the Western Safety rolling kneepads- these are a little bit unique because they come with a built-in tool holder and tray. One buyer we spoke with says that he works outside using the rolling the pad and he is especially grateful that it is able to keep his knees pain-free as well as dry during rain and snow storms.